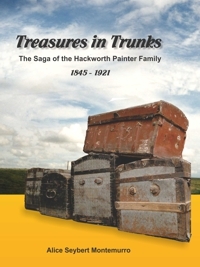 Alice Montemurro took 20 years to assemble the contents of five old family trunks into a book about her ancestors... the Painter family and the Hackworth family. She wrote the book in the voice of her great grandmother, Emily Painter... filling in the blanks with family lore handed down through the decades. Between her commentary Alice published the letters the family wrote to one another through the years. This is a family history, but it is much more to the people in Meade County Kansas. Alice's great grandparents came to Meade County in the very beginning of settlement and were very instrumental in the development of the area. So one get's a feel for what it was like to live on the raw Kansas prairie when neighbors were few and hardships were plentiful. A great deal of Meade County history was entwined in this family's history. It is a large book, 464 pages, 8.5 x 11, and well worth the read. James Herron left his father's ranch in Texas at the age of thirteen to join a cattle drive heading for Dodge City, Kansas. 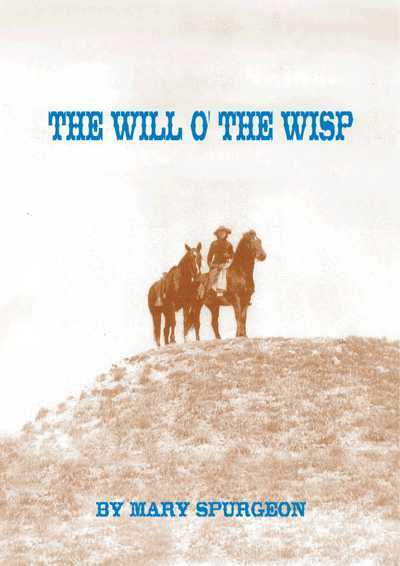 The book tells of his adventures growing up in Southwest Kansas and the Oklahoma Panhandle... how he became an open-range cowboy and eventually the first sheriff of No Man's Land in the Oklahoma Territory. Herron's entrepreneurial spirit eventually led him to build up a herd of his own... something very much frowned upon by the Western Kansas Cattle Growers Association. When Jim shipped a load of beef to Nebraska, the Association sent inspectors who claimed to have found some of their brands among Herron's cattle. He was tried in Meade, Kansas, September 1893, and found guilty. Before he was to be sentenced, however, he and his sidekick, Jack Rhodes, escaped. Jack was shot and died on the outskirts of Meade, but Herron made it to "No Mans Land" where the law couldn't touch him. 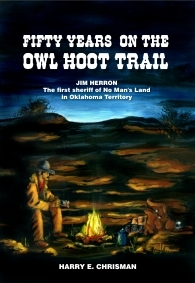 He spent the rest of his life running from the law... a situation the cowboys called being on the "owl hoot trail." 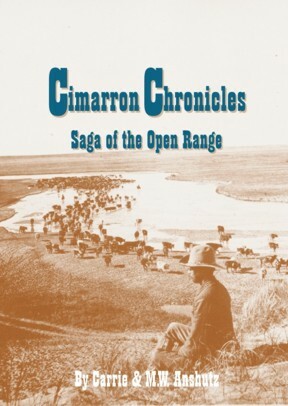 This book contains the story of Doc and Carrie Anshutz and their experiences on the prairies of Southwest Kansas and the Oklahoma Panhandle in the years from 1879 to the turn of the century. The first part of the book is Carrie's story... about how she came with her family to Southwest Kansas a child of ten. She writes of the adventure, heartbreaks and good times she experienced growing up on the Kansas prairie. The second part of the book is Doc's story. He came to this raw country a boy of 15. He tried various lines of work, but ended up a cowboy on the vast open range that encompassed southwest Kansas, northwest Oklahoma and the Oklahoma and Texas panhandles. Follow Doc through endless hours in the saddle and share in his day to day life that was full of adventure. Laugh at the antics of his cowboy companions and ride along as they flee a tornado or control a stampede. This well-written account of these two interesting lives is entertaining as well as informative. Eva Dalton, sister to the infamous Dalton Gang, lived in Meade, Kansas, in the mid to late 1880's. Her home in Meade was preserved as a tourist attraction over 60 years ago and remains today a piece of history in itself. In The Dalton Gang and Their Family Ties one can learn about the preservation of the hideout and the story of Eva and John Whipple, the man she married while in Meade. This book contains information about Eva Dalton that can be found nowhere else. The book also contains a comprehensive study of the Dalton family by Nancy B. Samuelson, and a story about their outlaw career by a Dalton descendent, Bill Phillips, as well as interesting stories reflected by old timers in the Meade area. Bill Dalton's outlaw activity is explored as it relates to the Southwest Kansas area. This book will be of special interest to anyone looking for Dalton family genealogy. It is a small book, 6x9, 95 pages, but it is packed full of information and photos. 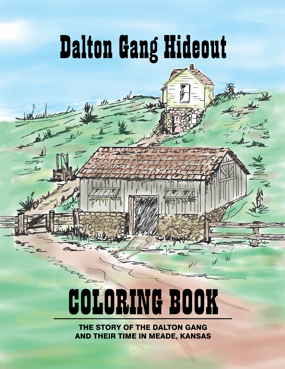 This coloring book tells the story of the Dalton Gang and their time in Meade, Kansas. The pages are filled with line drawings to color with a little bit of the story on each page. The story starts when Eva Dalton moves to Meade with her friend, Florence Doreland. You see their millinery shop and the mercantile store where Eva first meets John Whipple... then when she and John marry and move into their honeymoon cottage. You find the outlaw brothers digging the tunnel that leads from the house to the barn, and sitting around Eva's table plotting their next move. 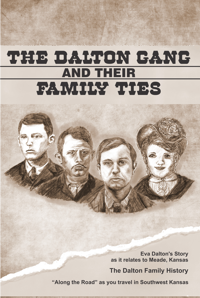 The book shows the criminal activity of the gang... as well as their demise and the capture of the youngest member, Emmett Dalton during their daring raid on two banks at one time in Coffeyville, Kansas. It is geared toward the young reader and teaches the premise that "crime does not pay." 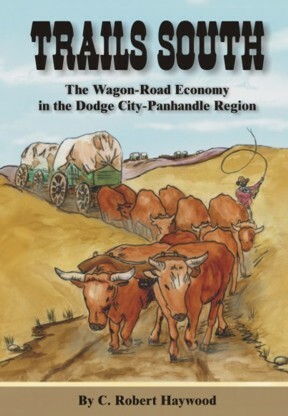 As the expanding American frontier stabilized in western Kansas after 1870, Dodge City witnessed a lively trade to the south and west, across the Oklahoma and Texas panhandles. As the U.S. Army wound down its long war against the Plains Indians, it blazed a rough trail to serve the garrison to Camp Supply, in what is now northwest Oklahoma. There were other needs for trails as well; to serve towns, settlements, trading posts, farms, ranches and other military installations. With a writing style that is both meticulous to accuracy and at the same time entertaining, C. Robert Haywood has put the story of trail development in the Dodge City-Panhandle region into historical perspective with his account of the people who made this vast transportation network possible; the troops and early entrepreneurs who laid out rough paths, the freighters who refined and developed those paths into established routes, and the people who serviced and were served by the routes. 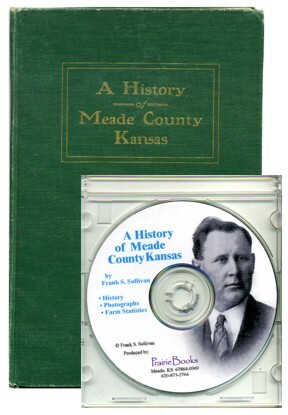 Sullivan's history of Meade County was probably the first book written about the area and is highly prized by the few who actually own a copy. Written in 1916, this book documents our history from pre-acquisition through the early 1900's. Since the book is so long out of print and many people have expressed an interest, we have published a new edition as an E-Book. This book is on a CD in PDF format in three different files: A History of Meade County, Farm Statistics, and Photographs. The CD also contains a "READ ME" file explaining its contents. This E-Book requires a computer for reading. 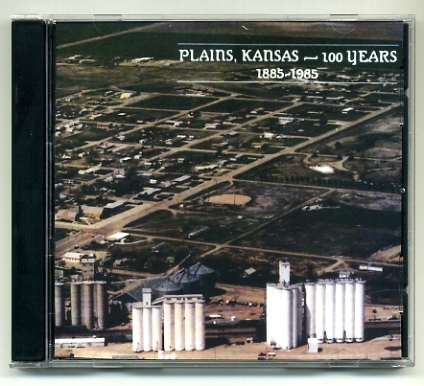 Plains, Kansas - 100 Years is a book published by Joyce Knott at the time of Plains’ Centennial in 1985. The research, writing and assembling of this information was done by Joyce and a dedicated committee of historians from Plains. You will find them all listed on page 3 of the book. The book chronicles the first century of this rural Kansas town... it’s people, it’s businesses, it’s farmers and ranchers. There are many family histories as well as the history of schools, clubs, churches and more. The text is in PDF format and completely searchable. 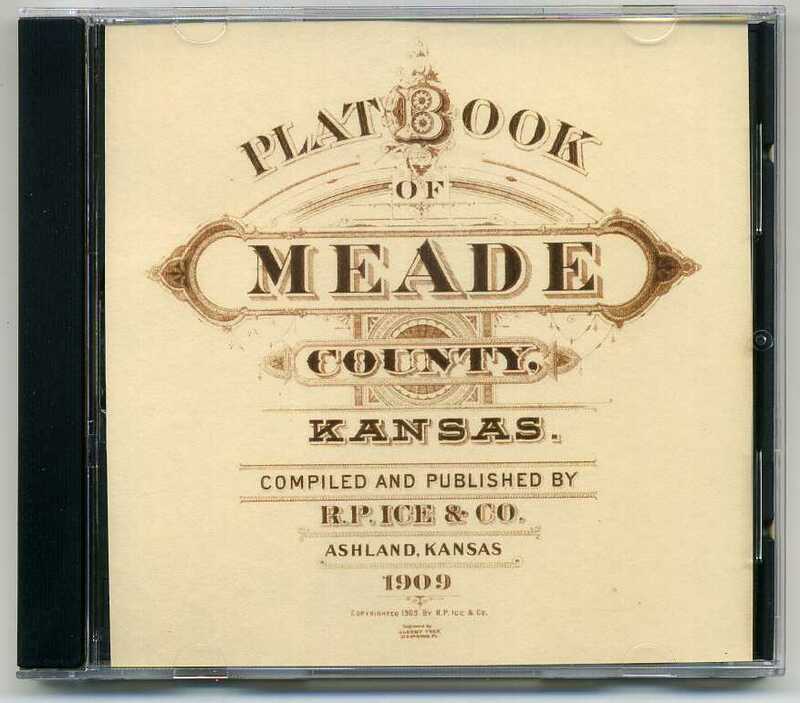 This CD contains a PDF file with scans of all the pages of the original 1909 Plat Book, as well as a complete index of every land owner in the County during that time period. 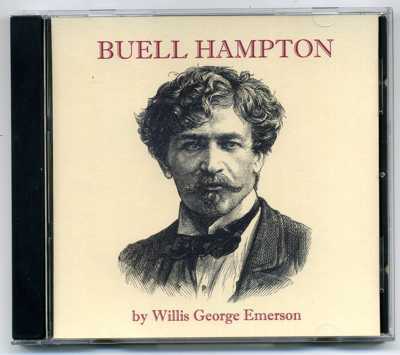 Buell Hampton is a novel, published in 1909, that takes place in Meade, Kansas. Several of the characters are based on real people, and many of the events depict actual history of the area. It is a story of a young banker who moves to this raw frontier town to seek his fortune. One of the people he meets is Major Buell Hampton, a larger-than-life character that is a mystery right to the end. The book contains all the elements one might expect, romance, intrigue, politics, danger, and humor. The time period is set in the early years of Meade County, when the cattlemen and farmers were at odds about who should control the land. Since the book is so long out of print and many people have expressed an interest, we have published a new edition as an E-Book. This book is on a CD in PDF format and requires a computer or tablet for reading. Mary Spurgeon's first novel tells the tale of Kathleen Wallace, a young woman who grew up in the yet-to-be part of Oklahoma known as "No Man's Land." With a desire to see another part of the country, Kathleen signed up to teach school far from home in the mountains back east. Little did she know how much this adventure would affect the rest of her life. Changed forever she returned to the west, soon to be joined by her new-found soul mate, Brennan, who feels he has to prove himself before taking the hand of the willful Kathleen in marriage. Brought together by a link to an ancient time and the mysterious will o' the wisp, the two of them face many obstacles as they make their way to fulfill their destiny. This novel is based loosely on the authors amazing life spent on ranches in Southwest Kansas and the Oklahoma Panhandle. An accomplished artist, Mary Spurgeon has proved to be just as creative with the written word as she is with her sculpting tools or paint brush. The book is illustrated with examples of the author's art.